Are Stinky Smelly Feet Hereditary? | What is ML Reading? Are Stinky Smelly Feet Hereditary? When I picked ML from camp Monday, she took her shoes off in the car. The smell was atrocious. There’s no other way to say it. ML has stinky feet. Apparently, it’s hereditary. I got them from my dad. . . ML got them from me. 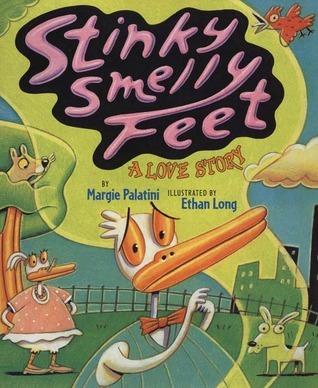 We love Stinky Smelly Feet: A Love Story by Margie Palatini. Two ducks, Dolores and Douglas are in love, but Douglas has stinky, smelly feet. Dolores passes out every time Douglas removes his shoes. What’s a duck to do? Thankfully, ML’s and my feet haven’t ever caused someone to pass out. As for my dad’s feet. . . no comment. This entry was posted in Picture Book and tagged Dad, Feet, Five Senses, Margie Palatini, Stinky Smelly Feet by mlreads. Bookmark the permalink.